One of France’s finest winemakers explains the philosophy behind his art to a fascinated Curtis Marsh. I recently attended an enlightening symposium on riesling and pinot gris held by the ardent winegrowers of Nelson, New Zealand. Situated in the very north of south island, Nelson is somewhat over-shadowed by its commercially heavyweight neighbor Marlborough. However, as clearly evident in the regional and international tastings we experienced, Nelson – and New Zealand as a whole – is making world-class examples of these varieties. Equally commendable was that organizers secured pre-eminent biodynamic Alsace producer Olivier Humbrecht from Domaine Zind-Humbrecht and iconic Australian riesling producer Jeffrey Grosset. Respectively perspicuous and demonstrative presenters, it was fascinating to learn more about the polarity of vine growing and winemaking philosophies applied in different hemispheres. Similarly engaging was the indigenous Maori custom of greeting distinguished guests who rubbed noses with a local tribal elder on behalf of his ancestors. To quote Humbrecht, who took it all in his stride: “An interesting experience.” At a towering two meters tall and imposingly solid, Humbrecht looked as if he would be just as at home on one of the local rugby fields. I caught up with him again in Singapore, at the Raffles hotel 12th Annual Wine, Food and Arts Experience where his presentation of Zind-Humbrecht wines was the star attraction. 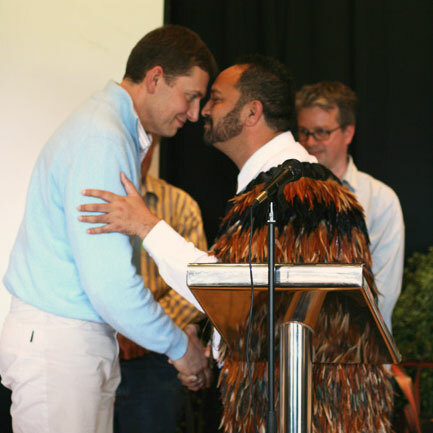 Olivier Humbrecht greeted by Maori Elder at Nelson Aromatics Symposium. 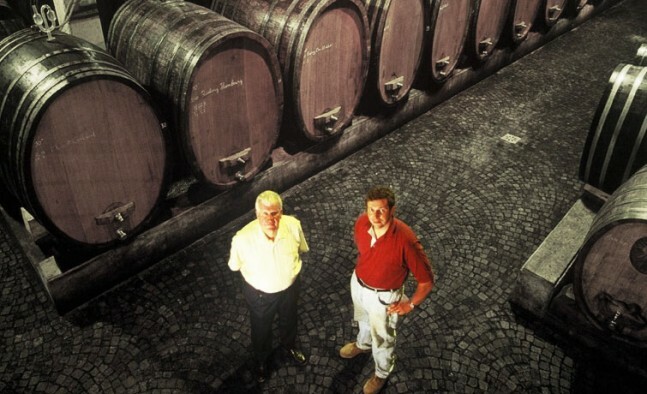 The Humbrecht family has been growing wines in Alsace since 1620, although Domaine Zind-Humbrecht is relatively new. It was founded in 1959 when Humbrecht’s father Leonard married Genevieve Zind, from an equally venerable wine-growing family. Domaine Zind-Humbrecht has prospered as a father-and-son team, with Olivier translating Leonard’s acquisitions of steeply sloped, labor-intensive, low- yielding acreage into highly prized grand cru and individual vineyards. 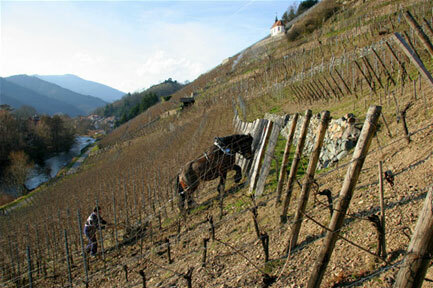 The vineyards were purchased during the 1970s and 80s in a recessionary period when most Alsatian growers were exploiting flatter vineyards and higher yields. The biodynamic calendar is in essence similar to the Chinese lunar calendar used to identify traditional holidays, festivals and in determining auspicious days for important events. At my suggestion that the Chinese may comprehend and embrace biodynamic wines more easily than Western cultures, he launched into a crash course on biodynamics and sustainable farming practices, a subject about which he is passionate and animated. Over the next 30 minutes, pausing only for a sip of coffee, Humbrecht covered everything from the creatures that crawled out of the ocean 450 million years ago to Darwinian theory, pagan farming and Roman gods, constellations and the gravitational effects of the moon. I commented that the ancient practice of feng shui is based on the energies of wind and water. “I am sure when Rudolf Steiner came up with his theories, that he studied many ancient civilizations’ agricultural practices and ways of life, and for sure, China,” Humbrecht said. “The Chinese have always observed plants very closely, utilizing their medicinal qualities. Take, for example, the willow tree. They noticed that it always grew quickly near water, had extremely supple branches and was never sick; therefore it should have excellent medicinal attributes, perhaps for aching bones. Zind-Humbrecht's famous Grand Cru vineyard 'Rangen', in the far south of Alsace. The intrinsic heart and logic of biodynamic viticulture is to produce terroir-driven (total vineyard environment) wines, redolent in minerals and distinctive soil characteristics. Clearly this works for Domaine Zind- Humbrecht, whose wines are unparalleled in minerality and expression of the remarkably diverse and unique soil structures of its vineyards. The steeply terraced grand cru vineyard Rangen Clos Saint Urban sits on 400 million- year-old volcanic rock and sedimentary sandstone while the Clos Hauserer vineyard features 40 million-year-old marl and limestone with top soils rich in clays and chalk from the glaciers formed around this period, at a time when saber tooth tigers roamed those parts. Olivier Humbrecht also strives for maximum ripeness, pushing this to the limits with his late-harvest wines, achieving extraordinary intensity and concentration, yet maintaining acidity and finesse. These late-harvest wines are also unusually drier than most, due to abnormally long natural yeast ferment (up to 12 months as opposed to three weeks in the new world) exclusively in large wooded foudres. From the extensive range of riesling, gewurztraminer and pinot gris, it is perhaps riesling that is most expressive of its terroir imprint. Try the Clos Hauserer Riesling 2004: scents of summer fields, river pebbles, slate and damp earth set the frame overlaid with lemon and ripe gooseberry, tangy apricot and custard- type characters among ginger spice. Wet slate, granite earthy are the first impressions; a lemon attack, racy pickup and spiciness accelerate across the palate with amazing intensity. Enhanced minerality, bony and chalky, finishes long, going on and on with lemony acidity and wet slate (HK$538 bottle). For information on the Nelson wine growing area and its arts scene go to www.wineart.co.nz. Also recommended reading: Monty Waldin’s Biodynamic Wines (Mitchell Beazley, HK$400) and Nicholas Joly’s Wine from Sky to Earth: Growing & Appreciating Biodynamic Wine.